With major state funding cuts looming, for many school districts, it's not a question of if — but how and when — teacher layoffs will occur. A new bipartisan bill from education leaders in the state Senate could temporarily change how schools go about that. Currently districts must provide 45 days notice to teachers if their contracts are not going to be renewed. Once teachers receive word of that notice, they have 15 days to request a hearing. A bill by state Sens. Royce West, D-Dallas, Florence Shapiro, R-Plano, Robert Duncan, R-Lubbock, and Wendy Davis, D-Fort Worth, announced at a Capitol press conference Thursday would give teachers 30 days instead of 15 to request a hearing. The idea behind the newly filed SB 912, which the senators developed with input from teacher, administrator, and school board organizations, is to buy time for districts who may be forced to fire teachers soon even as the Legislature continues to work on what many hope will be an improved budget plan. "Teachers are the No. 1 most important element in the classroom," said Shapiro, who chairs the Senate Education committee. "They come first and we've got to make absolutely sure that teachers across this state recognize that we are working diligently every single day to help them." As the senators took questions from the media at the conference, Shapiro also said she believed the Legislature would use some of the Rainy Day Fund to increase general revenue in the budget. Davis, who also sits on the Education committee, said she hoped the bill sent a message to teachers that the Legislature is doing "as much we can in a difficult situation." The legislation also contains a provision that allows districts to designate a lawyer to conduct the hearings in lieu of full a school board. If the estimates of potential layoffs into the 100,000s are accurate, school boards would be overwhelmed. Eric Hartman, spokesman for the Texas branch of the American Federation of Teachers, emphasized that the legislation was "not something that permanently changes teacher contract rights in Texas." If it secures a two-thirds vote in both chambers, the bill would take effect immediately — and would apply only for the current school year. The most obvious way to make up for the cuts in state aid would be to increase financing from the federal government or to raise local property taxes. Cutting $10 billion from the state’s bill for public education could push more than two-dozen school districts from the group that receives state financing into the group that writes checks to the state to even things out between richer and poorer districts. That’s dangerous political territory, but familiar terrain for Texas lawmakers. They’ve been in trouble with the courts over school finance for decades, and generally move to change things only in the face of lawsuits. But over the years, they’ve also been careful to make sure districts don’t go backward financially, using “hold harmless” provisions to ensure that changes in school finance law don’t cost districts their state aid. By one estimate — from the Texas Taxpayers and Research Association — those requirements now account for $5.5 billion of what the state sends to school districts. Despite those provisions, and the fact that public education eats up 41.2 percent of the state’s general revenue, the state government paid less than half of the cost of public schooling in Texas. Texas has a school finance system that would have made Rube Goldberg giggle. It is a mash-up of state, local and federal taxes — the state paid 42.9 percent of the total, the districts paid 47.1 percent, and the federal government covered the other 10 percent in the 2009-10 school year, according to the Texas Education Agency — that is supposed to provide kids in every nook and cranny of the state with the same educational opportunity. It forces lawmakers to balance the financing of schools where property values are high with those where the values are low, all without dictating local school property tax rates. Not surprisingly, it ends up in court every few years, with the state getting sued by whichever group of schools feels most mistreated at the time. The state’s red budget could trigger the next round. 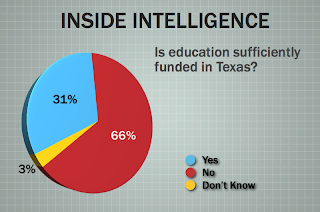 The Texas Education Agency — directed by Robert Scott, a former aide to Gov. Rick Perry — asked lawmakers for $10.4 billion more than those lawmakers included in their proposed two-year budgets. That’s a little more than $1,000 per student, and the first set of printouts detailing what that might mean to each of the state’s school districts was a sea of negative numbers. According to the Texas Taxpayers and Research Association’s estimates, per-student spending would drop to $7,850 in 2013 from $9,200 in 2010, or about 14.6 percent. Wealthier districts that already send locally raised tax money to the state — so-called “recapture districts” — would send more. Districts that get money from the state would get less. And depending on how it’s done, some districts that now get money from the state would have to turn around and write checks instead. According to Moak, Casey & Associates, an Austin-based school finance and accountability consulting firm, a budget cut of that size could shift 30 new districts onto the recapture rolls, bringing the total to 195 districts and raising the amount sent by that group to the state to $1.4 billion from the current $959 million. Daniel Casey, a partner at the firm, who has years of experience in school finance, said the details of what will happen to each school district are unclear until the Legislature decides how to distribute money, what to allow school districts to do with their own taxes and so on. But there’s no way to absorb cuts of that size without affecting the whole system and, some lawmakers and experts say, without putting the state back into court defending its system. That’s enough numbers to numb most lawmakers, but the politics of it could wake them back up. The most obvious way to make up for the cuts in state aid would be to increase financing from the federal government or to raise local property taxes. The state and the feds are arguing over $830 million in federal funding that Perry refused because of requirements it would impose on state education spending, but even that is not enough to cover a $5-billion-per-year hole. And the financial problem is only half the trouble; getting the money always, or almost always, forces some change in the balancing formulas. One trial balloon rises with every school finance crisis, and generally takes 24 to 48 hours to crash to the ground. In the early 1990s, it came from state Sen. Carl Parker, D-Port Arthur. Sen. Bill Ratliff, R-Mount Pleasant, gave it a try a decade later. And this week, it was Sen. Robert Duncan’s turn. Something like that might keep the state out of court on school finance. But it wouldn’t solve the other, bigger problem. Got $10 billion to spare? Our insiders took on school finance this week, and they're not optimistic that there will be a happy ending. Do they think the Legislature will close the gap? Yes and no. Twenty percent say the schools will end the session $10 billion short, while 70 percent say they'll end up less than $5 billion short. 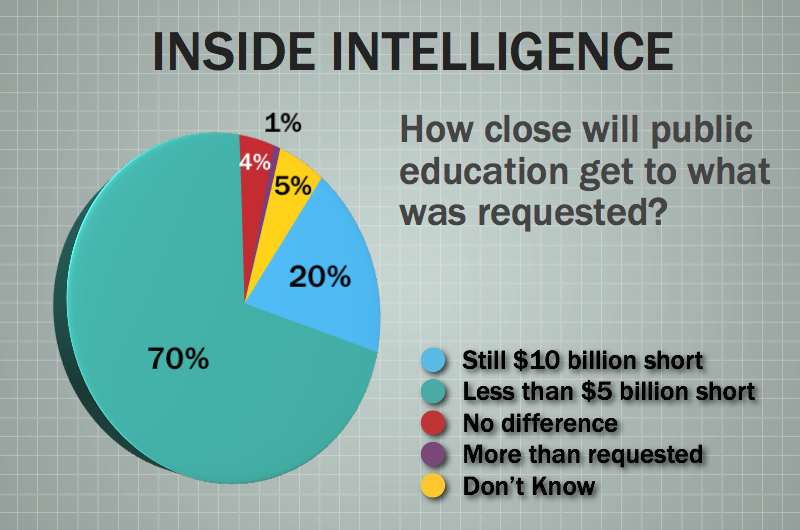 The remaining 10 percent split between full restoration, more money than requested and don't know. Should lawmakers free local schools to raise their property taxes to make up for money lost to state cuts? 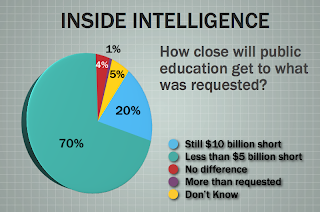 Most of our insiders — 70 percent — said yes, while 27 percent said no. • "School district administration is bloated, and everything else is starved." • "Administration; non-core programs; discretionary spending on curriculum, test preparation, consultants, public relations, etc." • "We should be investing in public education, not cutting it to the bone." • "The pensions of school teachers. They should have 401k plans like the rest of us and have to pay for their own healthcare." • "Building stadiums; consolidating school districts;"
• "General administration, ridiculously expensive and counterproductive pension policies and practices, labor practices that reward retaining ineffective teachers, inefficiencies due to too many districts, local and state programs with no record of success in boosting student achievement, sports excesses, and inefficiencies due to inadequate use of technology"
• "Start with non-classroom expenditures. Next: support and administrative staffing has increased 20 percent since 2004, while student population has risen 7 percent. Moving from the current 1:1 teaching/non-teacher ratio to a 3:2 ratio would produce $3.25 billion in savings. Force a reduction in administrator pay and bonus packages. Abolish the regional service centers." • "The Target Revenue entitlement should be eliminated first (total elimination saves about $4.5 billion per biennium). Second, outside the system grants should be eliminated (saves about $2 billion). Delaying the July and August payments to districts moves another $3.7 billion into the 2011-2013 biennium." 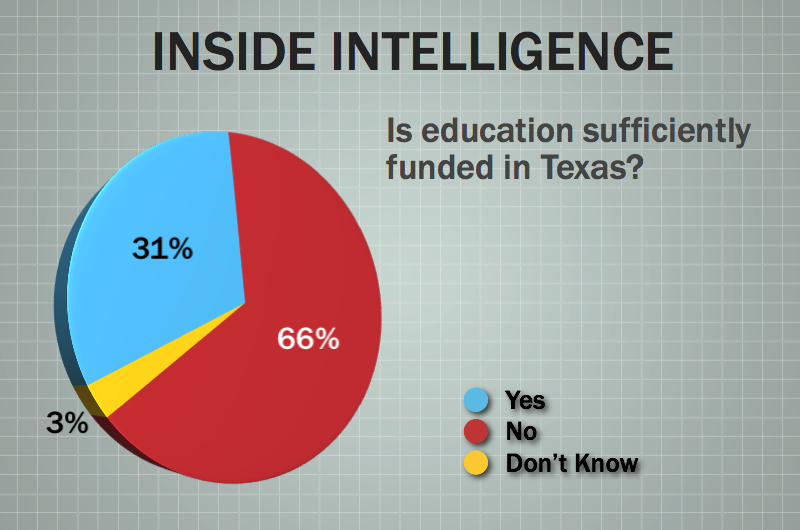 • "Wrong question, Texas ranked in the bottom quarter of states in per capita student funding throughout the 20th century and into the 21st century. Given the demographic changes taking place Texas needs to step it up, not cut back." • "Well now, that question reveals the conservative bias in the media! Do we just assume that we're getting overeducated in Texas, and it's time to trim it back a little? I know it's pointless to ask Who's taxes should be raised so that our kids are a little smarter when they get to tomorrow? But still! The arrogance of the assumption that, without question, some education should be cut back is just more than I can stomach." • "Though a tough political choice, consolidation of the smaller districts is one way to bring huge efficiencies to a bloated mess. Incentives for consolidation - and disincentives for not consolidating - should be in play." • "This is a no brainer. Consolidate school systems and drastically cut administrative expenses. If that doesn't do, fire teachers." • "None. Our entire education system from pre-K to post-secondary has been on a starvation diet for far too long. After over a decade of Republican mismanagement, Texas is already seeing the fruits of a policy that is virtually guaranteeing the creation of an entire generation of poorly educated Texans who will be ill equipped to compete and contribute to our state's prosperity. This is the ultimate mortgaging of our future, and I fear we will discover too late that it was a subprime one." The powerful payday lending lobby already has Texas senators reworking proposed legislation that would regulate what has become a lender of last resort for many Texans. Several lawmakers, led by state Sen. Wendy Davis, a Fort Worth Democrat, have filed bills that would prohibit payday lenders and auto title lenders in Texas from sidestepping interest rate caps by charging fees that, in some instances, can push the effective annual percentage rates on short-term loans above 500 percent. Texas is one of a half-dozen states that don't regulate payday or auto-title loans. In 2009, similar legislation to regulate the industry died in the Legislature without a floor vote. At Tuesday's legislative hearing, the first on the issue this year, Davis said she would rework her bill so it would regulate payday lenders for the first time, but also would create a special interest rate for the industry. "I'm willing to negotiate a unique rate structure," Davis said during a break in Tuesday's hearing. Payday lenders such as Cash America Inc. of Fort Worth, ACE Cash Express of Irving and EZcorp Inc. of Austin partner with banks, which make short-term loans. The industry uses brokers in neighborhood storefronts to take loan applications, review the applicant's credit and collect payments. The stores are typically located in lower-income areas, including along East Seventh Street and East Riverside Drive in Austin. The fees that the broker charges are not considered interest under state law. If customers cannot repay short-term loans on time, they can "roll," or extend, the note by paying more fees, running up the high annual percentage rates. "We're constantly rolling these people," said Sen. Royce West , a Dallas Democrat who has proposed a bill similar to Davis'. At Tuesday's hearing, however, the industry matched the bills' supporters, with witnesses including consumers, pastors and experts. "If this bill is passed, we will be forced to shut our stores down in Texas," said Jay Shipowitz, president of ACE Cash Express. ACE has 500 payday lending offices in Texas, including eight in Central Texas. Gerri Guzman , executive director of the Washington-based Consumer Rights Coalition , an industry-backed group, testified that the legislation would eradicate an industry that serves consumers who can't get short-term loans at banks or credit unions. "These people are underbanked," she said. "If this passes, consumers will be left without an important credit option." Michael Price of Austin and Frederick Haynes III of Dallas are pastors on opposite sides of the issue. Price said the industry financially supports his organization, Texas Coalition for Consumer Choice, which promotes personal responsibility and consumer freedom. He testified that short-term loan rates can be less than fees for bounced checks or penalties for paying utility bills late. Senators asked him whether it was fair for consumers to pay $1,200 in fees on a $500 loan, as a Houston woman testified about earlier in the day. "It depends whether she was informed on her decision," he said. Haynes said his church and three others have organized because "the community is saturated" with payday lenders. "We are concerned why our community has been targeted," he said. Haynes said payday loans are harmful to his church members: "Instead of throwing them a lifeline, we're throwing them shackles." Sen. Chris Harris, R-Arlington, said he had received only two complaints about payday loans over the past decade. Sen. Mike Jackson, R-La Porte, echoed that sentiment. "I'm wondering if we're trying to fix something just to fix it," Jackson said. "If there is a huge problem out here, I'm having a hard time finding them." Davis said that payday loan documents do not tell consumers where they can complain because the industry is not regulated. She said she's not interested in putting payday lenders out of business. But she complained that industry officials would not tell her what fee cap would allow them to make a profit and stay in Texas. The legislation was left pending in the Senate Committee on Business and Commerce while Davis and others rework the bill. The Dallas school district is proposing to offer up to $10,000 to teachers who agree to resign at the end of the year to lighten expenses before possible deep budget cuts. Under a plan that could be approved Thursday by DISD trustees, the teachers would receive an incentive of 15 percent of their annual salary, up to $10,000. It could cost the district up to $10 million and force it to dip into an already low reserve fund. The offer would be available to the first 1,000 teachers with contracts who volunteer. That would be about 10 percent of the district’s 10,600 teachers. Employees who accept the offer must notify the district by March 11, but they would work through the rest of the school year. The proposal comes as Dallas ISD grapples with how to offset a possible $253 million state-funding cut under a worst-case scenario. A reduction that steep could prompt the district to cut 3,900 of its 21,000 positions — 3,100 of those employees would be teachers or others at the campus level. Neighboring school districts have approved early resignation incentive packages in recent weeks as the Texas Legislature contemplates cutting $10 billion in public education funds over the next two years. But the packages pale in comparison with Dallas ISD’s proposal. The Rockwall school board approved a $1,000 incentive this week. Cedar Hill is offering $1,000 to the first 50 teachers who step forward. Irving is offering $500 to staff and $1,000 to teachers if they’re among the first 250 employees to resign. Only 79 employees have accepted so far. “It’s not bad, but we are certainly not at 250 with about 21/2 weeks to go,” said Irving ISD spokesman Tony Thetford. Local and state teacher associations praised the district’s proposal and said they believe many teachers will jump at the offer. “I think it’s great,” said Rena Honea, president of teachers association Alliance-AFT Dallas. She said teachers at or nearing retirement age would be the most likely candidates. The deal comes with caveats, however: An employee who takes the offer cannot file for unemployment benefits. Also, few teachers would qualify for the $10,000 incentive cap, which applies to those making about $66,000 a year. Only those with about 35 years of experience are paid that much, according to DISD records. Clay Robison, spokesman at the Texas State Teachers Association, said it was the largest offer he’s heard of and he believes it will get teachers’ attention. “If the teacher is nearing retirement or thinking about retirement, it’s certainly preferable so they can have a little extra,” he said. But Dallas ISD’s incentive package wasn’t praised by everyone. DISD trustee Lew Blackburn said he believes the incentive would be accepted by 1,000 teachers, but a $15,000 offer might be snatched up sooner. Dahlander, the district’s spokesman, said he didn’t know how much the district could save or the size of the severance package laid off employees might receive. In 2008, DISD laid off 415 educators, who received a severance package of two months pay and benefits if they didn’t challenge the termination. If trustees approve the proposal, the district could use up to $10 million of its roughly $70 million in reserves. Dallas ISD projects to end this school year with a $20 million surplus, but district officials have tried to improve the reserves and have cautioned against tapping into it. Michael MacNaughton, a founding member of the watchdog group Dallas Friends of Public Education, questioned the proposal. Staff writer Tawnell D. Hobbs contributed to this report. Officials won't confirm numbers, but past state budget history could signal losses in the hundreds. The Texas Education Agency laid off an unspecified number of its 1,054 employees Tuesday, with Education Commissioner Robert Scott releasing a brief statement acknowledging the beginning of a process that could reduce the agency's staff by hundreds. "Based on the impending budget reductions, we have taken steps to reduce the size of the agency. We will continue our mission to serve our school districts and students," he said. The final tally of axed employees will be determined in the Legislature's final appropriations bill. Texas' 2003 budget shortfall — about $10 billion — resulted in 200 TEA layoffs, and this year, lawmakers are attempting to close a gap of $15 billion to $27 billion. Debbie Ratcliffe, a spokeswoman for the agency, described the mood as "very somber" around the William B. Travis Building, where the bulk of TEA employees work. She declined to give specifics on the number of state employees or positions that were eliminated, saying the agency was informing employees individually. Exact numbers would probably be available later this week, she said. At the beginning of 2010, Gov. Rick Perry and legislative leaders asked all state agencies to reduce their costs by 5 percent. In December, they requested that agencies find an additional 2.5 percent of their budgets to cut. Tuesday's layoffs are the latest development in a budget crisis that could cut up to 9,600 state jobs before all is said and done. TEA has cut about $153 million from its budget since the reduction orders were issued, Ratcliffe said, but Tuesday's layoffs were the first significant hit for the agency since 2003. Ratcliffe said these layoffs are not so much part of Perry's belt-tightening request but rather "more in anticipation of what's to come." "We know that this may not be the end of it, depending on what happens with the budget," Ratcliffe said. Other state agencies are feeling similar budget pain. The Department of Information Resources cut 22 positions in late January. The Department of Criminal Justice will cut 555 positions by April 15, with notifications to employees beginning next week, agency officials said. Depending on the final budget, as many as 1,200 more jobs could be eliminated from the state's correctional agency. TEA, which serves as a guiding force and administrative hub for public education statewide, is cutting positions as school districts are also preparing for big cuts to teachers and other personnel. On Monday night, the Austin school district upped its estimate of those to be laid off, bringing its potential job losses to more than 1,100. "There's probably some sentiment that if school districts are going to be hit, then the state education agency also needs to get leaner," said Andy Homer, director of government relations for the Texas Public Employees Association. Hundreds of Texans descended on the state Capitol on Tuesday to draw attention to what they say are dozens of bills that, if passed, would hinder economic development, stymie education and — above all — encourage racial profiling in the Lone Star State. Some marched and waved signs supporting the United Farm Workers. Others, cloaked in Texas and U.S. flags, proclaimed that “Texas Can Do Better Than Arizona.” The immigrants’ rights advocates, former military personnel, lawmakers and students — from seemingly every rural and urban sector of the state — rallied and proclaimed that bills like HB 17 and HB 22 would serve only to increase insecurity and distrust within immigrant communities, hinder Texas’ future workforce from being competitive and lead to an increase in crime. 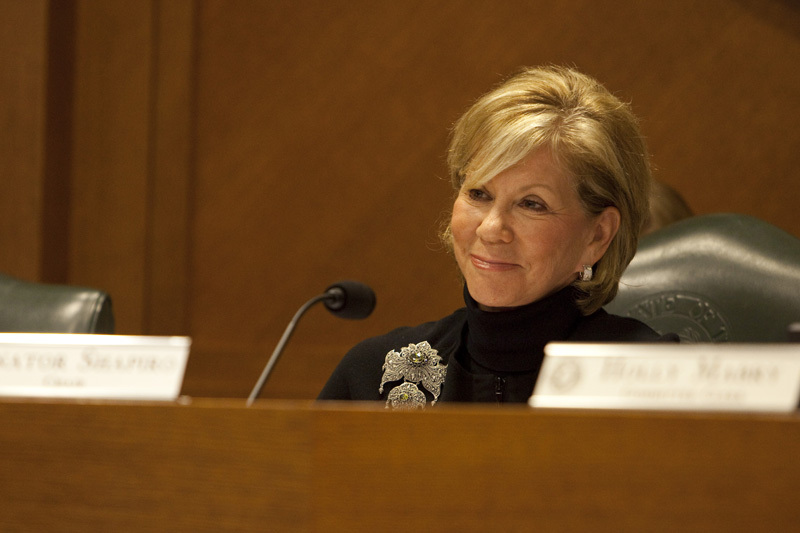 The bills, by state Rep. Debbie Riddle, R-Tomball, would make it a Class B misdemeanor to be in the country without proper documentation and mandate that school districts report the immigration status of their students. Riddle has also filed HB 1202, which would make it a state jail felony to knowingly and “recklessly” hire an unauthorized worker. Immigration-related legislation faces its best chance of passing in decades after a Nov. 2 election that tilted the balance of power to the Republican Party in Texas. Republicans now control the Texas House, 101 to 49. Despite the shift, however, Democratic lawmakers are pushing their own legislation. State Sen. José Rodríguez, D-El Paso, touted his SB 600, which would prevent law enforcement from asking the immigration status of victims of or witnesses to crimes. Rodríguez said the cooperation of the immigrant community has made El Paso one of the safest cities of its size. Added state Rep. Lon Burnam, D-Fort Worth: “You are here to say ‘no' to the most racist session of the Texas Legislature in a quarter of a century." While schools may not be graded based on test-performance in the first year, students will be, especially those beginning high school in the upcoming 2011-12 academic year. When you experiment with children and their education there are no do-overs. You can never go back and give them what they lost. As Texas school districts brace for budget cuts and layoffs in the coming months, many education advocates are particularly concerned about the state's roll out of a new testing system in 2012. The State of Texas Assessments of Academic Readiness, or STAAR, will track student, school and school district performance, replacing the current Texas Assessment of Knowledge and Skills. With current state budget proposals set to cut public education funding by about $10 billion, some want STAAR implementation delayed to give districts time to recover from the 2011 cuts. Dax Gonzalez, a spokesman for the Texas Association of School Boards, said some of those cuts would dramatically reduce the amount of money set to help students prepare for the more rigorous accountability tests and ax many of the remediation programs that will help students who fail the tests. "Additional instruction and preparation for students and training for teachers is key," Gonzalez said. "So we're really setting our kids up to fail if we implement a new accountability system without providing for the additional resources necessary for preparing the students and teachers." But Sen. Florence Shapiro, chairwoman of the Senate Education Committee, said current budget proposals are still in draft form. "Right now we're looking at a base bill," said Shapiro, R-Plano. "And the numbers are going to be significantly different at the end of the day." The state has spent the last five years preparing for STAAR, and there's no reason to slow down now, she said, especially since school districts won't be graded on STAAR results in the first year. "We've already put in a lot of money. All the tests are done. All of the curriculum is done," Shapiro said. "We need the textbooks, obviously, which I'm working towards. That's my first goal, to get the textbooks prepared and brought to the schools. But everything is in place." If something goes wrong the first year, the state can make changes and even slow down implementation, she said. The contract with the company that designed the test allows the state to renegotiate without paying a penalty. But Gonzalez said that even if the first year of testing doesn't count, schools and students could still take a psychological hit if test scores take a tumble. "When you bring in a new system and the students don't necessarily know what they are in store for, or if they happen to have a bad year testing wise," Gonzalez said, "that can really do a lot to damage the morale of a school and students." Dr. Rene Antrop-Gonzalez is a dear friend and colleague who teaches at the University of Milwaukee in Wisconsin and here is his brief report that he shared with me this morning. Good morning! It's been a whirlwind 5 days in the state of the Green Bay Packers! Yesterday, 70,000 of us marched demanding "Kill the Bill!" and "This is what democracy looks like!" We had some interface with Tea Party activists who were drunk with the idea that public workers are parasites. They make no mention at all of the extent to which large corporations are getting filthy rich off of OUR backs--the rich created this deficit using Republican (and some Democratic) politicians as their tools! On a second note, I differ with labor's stance on making concessions on public worker pensions and health care benefits. We should not be conceding a thing! The rich are not being asked to give up their benefits. Tax the Rich! Anyway, it was beautiful to witness and participate in direct action with folks from all over! Power to the People. WE WILL WIN! 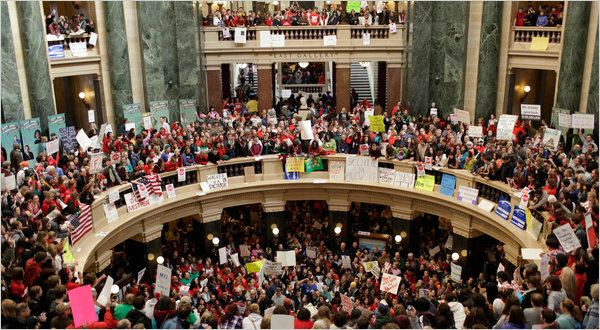 Remember, my fellow comrades, if this bill is passed in WI, it will also pass in your state. Finally, it was great to see immigrant activist groups also taking part in the protests. The UFW was in full force as well as Voces de la Frontera! Amazing story that tells of the power of the pen. An earlier version of this article misspelled the surname of Gene Sharp's assistant. Her name is Jamila Raqib, not Raquib. SAN JUAN, P.R. — Months of unrest at the University of Puerto Rico seemed to be reaching a finale over the last 10 days. 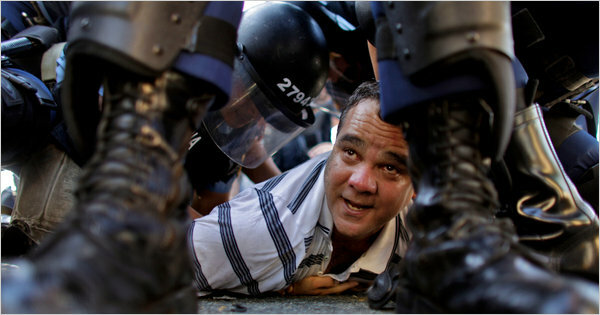 Scores of students were arrested or injured by riot police officers. Faculty and staff members held a two-day walkout. The president of the university resigned Friday, the police who had occupied campus were withdrawn Monday and an interim president arrived Tuesday. But there were only three days of peace. On Thursday morning, students blocked the stairs to classrooms in the social science department with trash cans and chairs, and also closed down the humanities department. At the social sciences building, students said only one professor had tried to get through the blockade. The spark for the university’s problems was a budget cut that required students to pay a new $800 fee, increasing their costs by more than 50 percent. The tuition is indeed far lower than most other flagship public universities. But Puerto Rico is poorer than the mainland United States, and two-thirds of the students have incomes low enough to qualify for Pell grants. As at many public universities elsewhere in the United States, students here worry that the new fiscal realities will restrict who can attend. Student leaders estimate that at least 5,000 of the university’s students were not able to pay the fee this semester. And the administration acknowledges that there are now fewer than 54,000 students this semester, compared with about 60,000 last semester. Dr. Muñoz, however, attributed the drop to instability, not the new fee. “As a parent, you don’t want to send your son, your daughter to a campus where you see so many protests, and police,” he said. Still, if there are threats to security and safety, he said he would not hesitate to bring back the police. “A university is not a different place from the rest of Puerto Rico,” he said. Protests may well flare up again. A general student assembly is scheduled for Tuesday, to discuss whether to call a further strike to protest the $800 fee, program cuts, and the unwillingness of the authorities to negotiate. But the students have flexed their muscles. A two-month strike last spring shut down the university’s 11 campuses. And since the current strike began in December — this time, largely at the main Rio Piedras campus in San Juan — people across the island have been riveted by television and YouTube videos of violent confrontations between students and the police. Many students were outraged that the police had been called to the campus. Some students, like Liz Lebron, a freshman, said they thought the administration had been right to bring in the police, because some students were destroying property and stopping others from attending class. Whether or not they approved of the police presence, many students said they found it frightening. Many students complained about the university’s decision to put several academic programs, including Hispanic studies, “on pause,” meaning they are not accepting new undergraduates. Some faculty members and students say that local politics have played a large role in the university’s problems. Puerto Rico has its first Republican governor in decades, Luis G. Fortuño, a pro-statehood conservative who has cut the number of public employees by about 17,000. Last weekend, while the protesters were marching in the streets, Mr. Fortuño was in Washington as a featured speaker at the Conservative Political Action conference. Even in the lull from protests early this week, students and faculty members alike said they had no illusion that the situation had been resolved. While it is hard to predict what will happen next, some students may be changing their approach. “What a lot of people are saying, and I believe too, is that we should be thinking about a movement of protest now, not really a strike,” said Omar Oduardo, a Student Council representative who spent Thursday at the social sciences department lobby, discussing the situation. public outcry rolling across the state of Texas. revenue, 47th in expenditures - leaving local governments to pick up the tab. and social benefits - jobs, higher wages, and innovation. insure fewer children, and emit more toxic chemicals than any other state. Texas. We can do better. Our financial situation is sobering - a $27 billion shortfall is dead serious. vulnerable, not close hundreds of nursing homes. future. For a better Texas. membership in the Legislative Budget Board. Check out the conservative response to the Common Core and Race to the Top. altLet’s pose a question. If you wanted to “sell” something that a number of people did not need, how would you do it? You might try setting up a contest where everyone competes for a significant financial prize. After all, Americans love to compete, especially when money goes to the winner. It is not too late for the "contestants" to quit playing this game. States that have taken no federal Common Core Standards (CCS) money can drop out of the game. Even states that have received some of their Race to the Top (RTTT) funds could make a plea to Congress to pass a "hold harmless" clause that would allow these states some relief. Action Steps are included at the end of this report. The NGA is a “bipartisan organization of the nation’s governors that speaks with a unified voice on national policy.” The CCSSO is "a nationwide, nonpartisan, and nonprofit membership organization…made up of states' chief school officers." When Secretary of Education Arne Duncan inserted a half-page program description into the Stimulus Bill in early 2009, few people except top Democratic leaders knew that it would create Race to the Top. This“Race” dominated the education news in 2010 because of the potential money that states could receive. Using a combination of the carrot-and-stick approach, the Obama administration has pressured states to adopt the national standards. In Bill Costello's comments (9.22.10), he captured the strings attached to taking the federal money: The Federal Takeover of Education. "As an incentive, states that adopted the Common Core by August 2, 2010 greatly improved their chances of receiving a share of the $4.35-billion Race to the Top federal grant. The strategy worked: most states adopted the standards. However, only nine states and the District of Columbia were actually awarded the money [in Phase 2]. All ten of those winners had adopted the standards. As a penalty, states that failed to adopt the Common Core risked losing funding from Title I, a $14.4-billion program that provides funds for low-income students. Most school districts participate in the Title I program." States spent millions of dollars and many hours filling out the complicated RTTT applications. According to the U.S. Department of Education's website, it took states an average of 642 hours to complete each application. That means it took two staff members, working full-time for two months (doing nothing else but working on the RTTT application), to finish the task. In her article on 1.26.11, Michelle Malkin captured some of this effort and the role of teachers’ unions: Federal Money Hasn't Bought Better Schools. "You need a chain saw to cut through the bureaucracies of the winning state applications, but the bottom line is that the ‘race’ is ‘won’ only when school reformers get buy-in from the teachers’ unions — the most stalwart enemies of introducing choice and competition to the atrophying system." In addition, loal and state bureaucrats who competed for RTTT grants like a pack of wolves snapping at juicy pork chops are finding the grants may cost more than they bring in. "It is in this context that we need to take a hard look at the costs we incurred under the Schwarzenegger administration when we accepted provisions of President Barack Obama's education initiative, Race to the Top, an unfunded mandate of the first order, costing millions and not at all essential. But Gov. Arnold Schwarzenegger and the legislature agreed to drop our standards, and then found that the state had been rejected by Race to the Top and would get no money. This means we must cover the costs of all the changes made to qualify for a race we didn't win. There are a variety of estimates of the costs we walked into, but what they have in common is that they will come to many millions of dollars. Consider that the "Schiff-Bustamante" bill passed in 1998 allocated $1 billion over four years to pay for textbooks aligned with the then-new California standards, in addition to the $70 million per year already allocated for textbooks. Grim projections come as well from the nonprofit EdSource, which estimates$800 million for new curriculum frameworks, $765 million for training teachers and $20 million for training principals, plus assorted minor costs, coming to a total of $1.6 billion." However, if California’s RTTT application had been chosen, California would only have received $400 Million. How could a $400 Million RTTT award cover the implementation cost of around $1.6 Billion? Obviously, California would be on the hook to cover the shortfall; and the same thing will happen to any state that tries to implement the CCS. What does the future hold for RTTT funding? Arne Duncan will reportedly ask for at least $1 billion in the 2012 Budget; but political insiders suggest he will get much less, probably closer to $500 million. Whatever the amount, it must be spread over the whole country. That means each state is vying for a diminishing figure, and nothing is guaranteed! With Republicans now in control of the House of Representatives, Obama no longer has an unlimited credit card! Could a state that has received an RTTT award drop the Common Core Standards? It is unlikely [but not impossible -- please see conclusion at the end of this paper] that a state would be able to pull out unless it repaid the federal funds. On 1.11.11, Catherine Gewertz explained: A Message for Common Standards in Race to Top Guidance? "The new guidance doesn't specifically mention or address the common standards. But as you might recall, all 12 of the RTT winners adopted them. They got points in their applications for doing so (as they did for embracing other reforms the department favors). So now that they've won money on those promises, the department wants to make sure that they're carried out. Those that wander too far from their key goals will be subject to ‘enforcement actions.’ [The heavy-handed fist of the federal government…"
As of 2.01.11, forty-two (42) out of the 51 states (50 states + D.C. = 51 “states”) have formally adopted the Common Core Standards. The nine (9) states that have not yet adopted the CCS standards are: Alaska, Maine, Minnesota, Montana, Nebraska, North Dakota, Texas, Virginia, and Washington. As Gewertz explained: A Message for Common Standards in Race to Top Guidance? Many states might jump off the national standards train. As Jim Stergios wrote on 11.16.10: Rumblings of an earthquake in national education policy? "The key states to watch are California, Indiana, Minnesota, *New Jersey, Texas and Virginia. In addition to being states that either did not adopt the national standards, or adopted them and did not win federal funds, they have one additional and important commonality among them: They have had higher standards than most other states in the nation." *The founders of the New Jersey Coalition for World Class Math ( http://njworldclassmath.webs.com ) strongly disagree with Mr. Stergios' inclusion of New Jersey in his grouping of states that have higher standards than most other states in the nation. The New Jersey math standards for Grades 9 - 12 underwent minor revisions in 2008; but the Pre-K through Grade 8 New Jersey math standards still reflect the pre-2006, discredited NCTM constructivist math standards and are not aligned with the recommendations of the The National Mathematics Advisory Panel. Texas Education Commissioner Robert Scott described the push for national education standards as "a step toward a federal takeover of the nation's public schools." "I am appalled that the public has not yet figured out that this federal takeover of the public schools is as bad if not worse than the federal takeover of the healthcare system. Remember that the Common Core Standards at this point are only for Math and English, but coming on their heels will be Science and Social Studies. Can you imagine what the standards/curriculum/assessments produced by the Obama administration would look like for Science and Social Studies?" "The standards are billed as ‘voluntary,’ but that's a joke. The Obama administration has already announced plans to make $14 billion in federal Title I funds and another $15 billion in future Race to the Top grants contingent on states adopting the national standards. In short, the standards would be as ‘voluntary’ as reporting personal income to the IRS, regulating the drinking age or maintaining the speed limit. Just try to opt out and see what happens." "At the behest of a local school board, three lawmakers in Massachusetts have drafted a bill that would override the state board of education’s decision to adopt new common academic standards. Mr. Cooke said he believes that in adopting the standards [Common Core Standards/Race to the Top], the state board was motivated more by the prospect of winning the federal Race to the Top contest—which awarded points to states that adopted the standards—than by what is best for students. And Mr.Cooke worries that embracing the standards will mean loss of local control over curriculum." I don’t think it’s in the best interests of the students at Tantasqua or even the Commonwealth of Massachusetts (to adopt the National Educational Standards). Massachusetts students fare better on classic achievement tests than students from any other state, so why would we want to go backward?" Adopting the final draft of proposed national education standards in English language arts (ELA) would result in a significant weakening of the intellectual demands placed on Massachusetts and California students in language and literature, according to a review published jointly by the Pacific Research Institute and Pioneer Institute. "CCRS consist wholly of content-empty and culture-free generic skills (e.g., ‘Analyze how and why individuals, events, and ideas develop and interact over the course of a text’)." I teach English because I love literature of all genres - drama, fiction and poetry - and I love to teach kids how to think and write critically through the close reading and study of literature. The study of literature is the study of the human condition. No other classroom offers that. Sadly adoption of the Common Core State Standards all but ensures that the classroom experience I just described is a thing of the past. Educators are displeased with many aspects of the national standards. Examples include: the standards havedropped cursive writing, English grammar and reading are weak, and grade-by-grade progression is poor in both English and math. The national standards in math were found to be weaker than some of the state standards (California, Indiana, Massachusetts, and Minnesota). That is quite unfortunate because STEM (Science, Technology, Engineering, and Mathematics) Education is especially important in this technological age. Also the math standards specified an unteachable number of topics (70 in one year). The Texas standards lay out the important skills emergent readers need to learn to be successful readers -- systematically taught phonemic awareness and decoding (phonics) skills. Sadly, the way the Common Core Standards are written would allow almost any whole-language reading program to satisfy them; and whole language instruction has been completely discredited by the empirical reading research done by the National Institutes of Health (NIH). How can the Obama administration take over the control of our nation’s public schools and impact the entire future of our nation? It is easy. All his administration has to do is to pressure teachers to teach each and every day whatever is on the national assessments that are tied to the national curriculum that is tied to the national standards. Then by making sure that individual students' scores are tied directly to their individual teachers and that those teachers’ performance scores are made public, the Obama administration will have achieved its goal of forcing teachers to indoctrinate their public school students. The indoctrination will promote such things as: subjective feelings, opinions, beliefs, multiculturalism, political correctness, diversity, global warming, homosexuality, and social justice. Where are the taxpayers in the downturn of our economy going to get the funds to pay for all of these new and expensive "techie toys"? "AC expects students to read 25 books per year but excludes the difficult classics right away…the AP Syllabus supersedes AC…AC pedagogy is more important than content…AC courses are designed specifically for kids reading at the 5th or 6th grade level in an attempt to get them reading at grade level we've changed from book-based, theme-based, literature-based to strategy-based. The emphasis of AC is not on college-readiness but is on how to fill out forms, on life skills, on reading instructional manuals, and gets rid of the classics." It was Achieve, Inc. (and the Council of Chief State School Officers) that paid for Massachusetts Education Commissioner Milton Chester’s frequent first-class travel and luxury resort expenses to such places as Arizona, Chicago, Washington, D. C., and London. "The goal of the initiative is to provide a voluntary, research and evidence-based set of standards for mathematics and English-language arts. Secretary Duncan has not been shy about his intentions to dramatically reshape education through the Race to the Top fund." And one key component of the Race to the Top guidelines is the requirement that states participate in and adopt a set of common academic standards. The only common, multi-state academic standards I am aware of are those being developed through the Common Core Initiative. Therefore, it stands to reason that any state wishing to receive funding through the Race to the Top program will be mandated to adopt the Common Core – and to test its students based on those standards. In October of 2010, Sen. Tom Coburn’s office released “Pork 101: How Education Earmarks School Taxpayers.” The report is mainly focused on federal education earmarks but also hits on overall federal education involvement. It shows that Washington has spent huge amounts of money on education over the last several decades, but there have been few-to-no corresponding improvements in national test scores. The report tells us: An Interview with Neal MCcluskey: School House Pork. The $4.35 billion Race to the Top (RTTT) competition was created under the Stimulus Bill (American Recovery and Reinvestment Act, or ARRA). Danaher Dempsey, Jr. rightly questioned the legality of the Race to the Top program. 1. For states that did not receive RTTT funding, it will cost them millions of dollars to switch to the national standards. In California, which did not win RTTT funds, it would cost them between $1 billion and $2 billionto convert to the Common Core Standards! Other states will face the same type of expenditures far-and-above the federal dollars to implement the CCS. 15. If no federal money has yet been sent to a state to implement CCS, then that state should be free to express"buyers' remorse" and to opt out of CCS. 7. Because the Obama administration cannot afford to fail with the RTTT plan, the U. S. DOE is busilymicromanaging everything in the RTTT states. Many states are having “buyers’ remorse” over their decision to participate in the RTTT scheme. A federal judge has ruled that ObamaCare is unconstitutional because of the over-reaching of the federal government into people's personal lives. The federal takeover of the public schools by the Obama administration is no less egregious. What is more precious than the minds of our children? Common Core Standards / Race to the Top never came before Congress for public hearings, debate, and a floor vote; and that is the reason the Obama administration has been able to capture the public schools of our country without the public's knowledge. Public Law that limits the authority of the federal government over states' rights and also prohibits the federal government from exercising any direction, supervision, or control over the curriculum and program of instruction in the public schools. 2. Urge your State Attorney General and the Congressional Oversight Committees to investigate the legalityof the government’s possible withholding of Title I funds. 3. Ask your Congressmen to stop the funding for CCS/RTTT. 4. Get your Congressmen to pass a bill that contains a hold harmless" clause whereby states would not have to pay back the CCS/RTTT funds already received. 11. Share this report with as many people as you possibly can so that there is a grounds well of grassroots objections to CCS/RTTT. It is not too late to get off the national standards train. Once the states have spent millions of dollars to convert to the national standards, they will not be very receptive to dropping them. The time to stop the train is now before it picks up speed. You can make a difference! Our country's educational future is at stake! Garner has been active in helping Texas develop new English / Language Arts / Reading standards and was a writer/researcher for Scott & White Hospital's Worth the Wait abstinence education program. She was also the writer/consultant for MyStudyHall.com, an online tutorial to help students (ages 10 through 100) to learn English skills. Higher Education in Egypt: What’s Next?